The Changing Face of Soldier Lethality! - The Americans .US! From the tangible to the cognitive, squad weapons to casualty care to performance-enhancing training, Army S&T is exploring and finding materials, technologies and methods in six focus areas to provide land forces the capabilities they’ll need for overmatch. Twenty years from now, Soldiers and small units will operate very differently than they did during the last two decades in Iraq and Afghanistan. As the Multi-Domain Battle Operating Concept emerges in the next 10 years, Soldiers will fight in multidomain environments characterized by dispersed, high-tempo operations that require small units to act independently in denied and austere regions. Soldiers will operate with shorter lines of sight and a reduced standoff advantage in their intelligence, surveillance and reconnaissance and long-range strike capabilities. Dense electromagnetic environments will make it difficult to establish and maintain persistent, trusted communication links. Soldiers will also face large, culturally diverse populations of noncombatants with whom they will need to communicate and who they will have to monitor for threats and protect from engagements, particularly in increasingly crowded urban regions such as coastal cities. Mitigating the impacts of these emerging challenges calls for Army science and technology (S&T) investments in Soldier lethality that account for the world’s complexity—operational, technological, societal and cultural. The three articles that follow highlight examples of capability investments in innovative, technologically advanced, potentially game-changing solutions focusing on 3-D enriched urban terrain visualization, improved performance and resilience, and augmented and mixed reality. What makes a Soldier and a small unit lethal? The Army’s S&T investment strategy addresses this question in both tangible and intangible ways. Tangible materiel elements of lethality include Soldier and squad weapons, communications, situational awareness and protection systems that allow Soldiers to shoot, communicate, maneuver and survive in varied terrain and phases of conflict. Capabilities that support a Soldier’s lethality include foundational training in executing missions and individual tasks, prolonged field medical care to treat injuries and sustain optimal performance, and physical and cognitive augmentation solutions such as wearable powered devices and nutrient delivery methods that increase strength and endurance. These will help direct Soldiers and squads and provide the speed of information that is becoming the cornerstone of overmatch. Equally important are the less tangible lethality capabilities that contribute to total Soldier and small unit performance, such as cognitive aids, conditioning, leadership and resilience training. These intangible enabling technologies work in concert with Soldiers and their equipment to create a professional, well-equipped force. To maintain the Army’s strategic, operational and tactical advantages, Army S&T is exploring and identifying materiel and nonmateriel solutions in six key areas of Soldier lethality that leverage technology advances to offer land forces the vital capabilities they will need in the mid- to far term. These six areas are Soldier and squad weapons; Soldier protection and equipment; situational awareness; physical and cognitive performance, along with Soldier-optimized performance; prolonged field medical care; and training. Small units require weapon systems that enhance lethality, accuracy and mobility to achieve and maintain overmatch against current and emerging adversaries’ technologies and operating tactics. Just as our adversaries invest in improving their weapons technology, Army S&T has the responsibility to modernize our legacy weapons ammunition and accessories. S&T support for next-generation weapon investments includes research into lighter-weight materials, improved ammunition design and penetration, modular component designs and integrated enabling technologies such as fire controls, optics and powered rails. The Army’s improved weapons and munitions need to be able to defeat adversaries who are using partial and full defilade to protect their positions and equipment, limiting the effects of our direct-fire small arms and indirect fire systems. In response, Army S&T seeks to reduce the precision, size and weight of counter-defilade capabilities for small units, putting counter-defilade in the hands of Soldiers and small units in combination with more lethal weapons and enablers, to keep pace with and overmatch the capabilities of adversaries. Army S&T seeks a balance of protection, mobility and the impact of such enhancements on lethality. 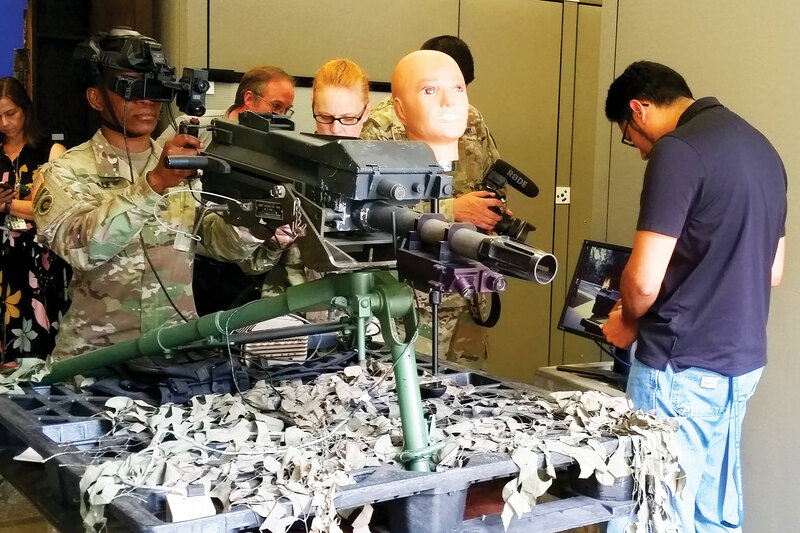 It boils down to a weight race, as the Army adds equipment to the Soldier kit faster than it can reduce weight through materials research, miniaturizing components and integrating capabilities into ergonomically designed systems and components. Research continues on lower-weight protection options for increased mobility and lethality as emerging directed-energy and ballistic threats proliferate. We also seek to reduce battery-related Soldier load with research on power harvesting, battery chemistries and energy management—all with the goal to extend dismounted Soldier operations for a 72-hour mission using adaptive systems that supply continuous power generation for up to six days. 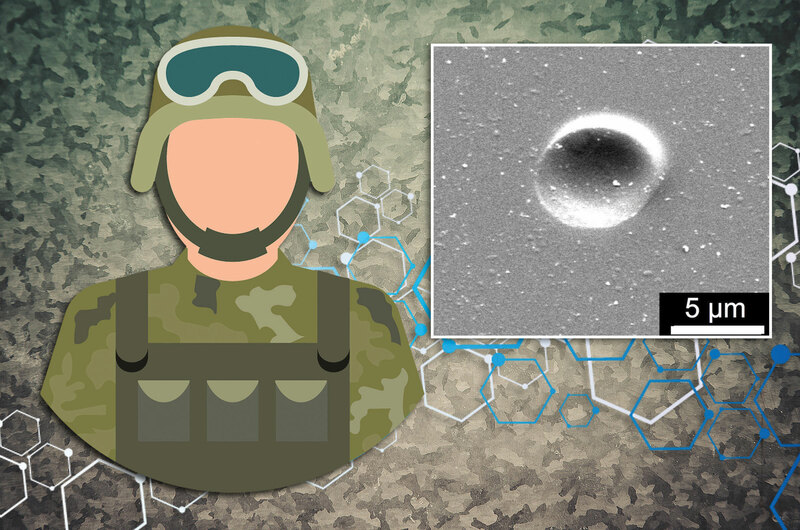 Army S&T is exploring bio-enabled and protective materials that combine protection against multiple environmental, detection and ballistic threats for clothing and individual equipment. It is also looking at signature management technologies to decrease the probability of a Soldier being seen and heard because of the thermal, electromagnetic or visual characteristics of the gear they wear and carry. Midterm body armor research focuses on vital torso protection against ballistic and blast threats, adding to earlier research on technologies that reduce Soldier-generated electromagnetic and auditory signatures. A related research area is developing mechanisms to understand human response and injury in blast, ballistic and directed-energy trauma. Army S&T also seeks to create injury-based performance criteria to support readiness determinations and product design. Information overmatch, by allowing Soldiers to surprise the enemy, increases the chance of mission success. Army S&T is developing strategic technologies to enhance our ability to outthink and outmaneuver an adversary with Soldier-wearable technologies. Small units must have situational understanding and a common operating picture to operate in close contact with the enemy and to conduct continuous security operations. Advanced sensors and displays for dismounts—Our focus is on low-cost Soldier-borne sensors, combat optical weapon sights and imaging and non-imaging sensors for individual and crew-served applications. These sensors will provide day-or-night capabilities enabling precision targeting and pointing, target marking and designation and obtaining accurate target locations at extended ranges. Soldier system interfaces and integration—These tactical system interfaces and decision aids reduce the cognitive overload caused by too much visual information, and support the 3-D visualization of mission command and sensor data to enhance tactical decision-making during dismounted operations. Soldier data management—We are developing Soldier-borne data management and distribution technologies whereby Soldiers can assess and maintain situational awareness and understanding, to enable real-time decision-making during dismounted operations. Hardware and software development address Soldier-centric integration and analysis of wired and wireless data management technologies, including Intra Soldier Wireless technologies and architectures, low-power sensor networks and Soldier-borne information assurance solutions. Emerging wearable technologies provide an unprecedented ability to collect high-resolution data continuously over significantly longer periods compared to the handheld and head-borne display systems in use today. Sensor data, combined with advanced modeling techniques and machine learning, have the potential to enhance cognitive performance and provide state-of-the-art situational awareness. Soldier load, a combination of cognitive and physical stressors, has increased as battlefield scenarios become more complex and Soldiers’ gear increases with the proliferation of capabilities and technological advances. Army S&T addresses physical and cognitive performance through our medical and human system integration (HSI) communities. 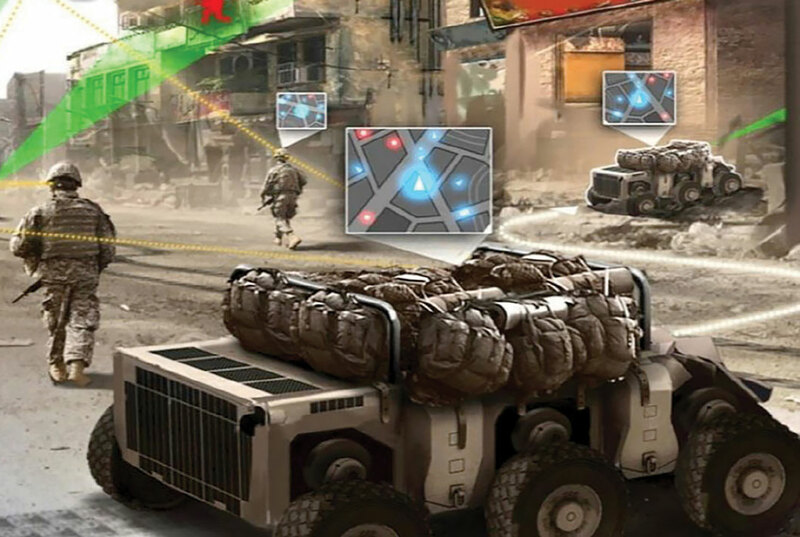 Current operating concepts assume that Soldiers can comprehend large amounts of dynamic, complex data arising from dense, urban, technology-laden terrain, and make efficient and effective decisions. Our research focuses on predicting the range of Soldier comprehension given varying quantities of information and tasks, in varying environments. Army S&T aims to enable Soldiers and small units to maneuver rapidly and engage adversaries in all environments, from dense urban areas to deserts, rolling terrain, mountains and jungle, and to operate in distributed small units as well as larger formation missions. 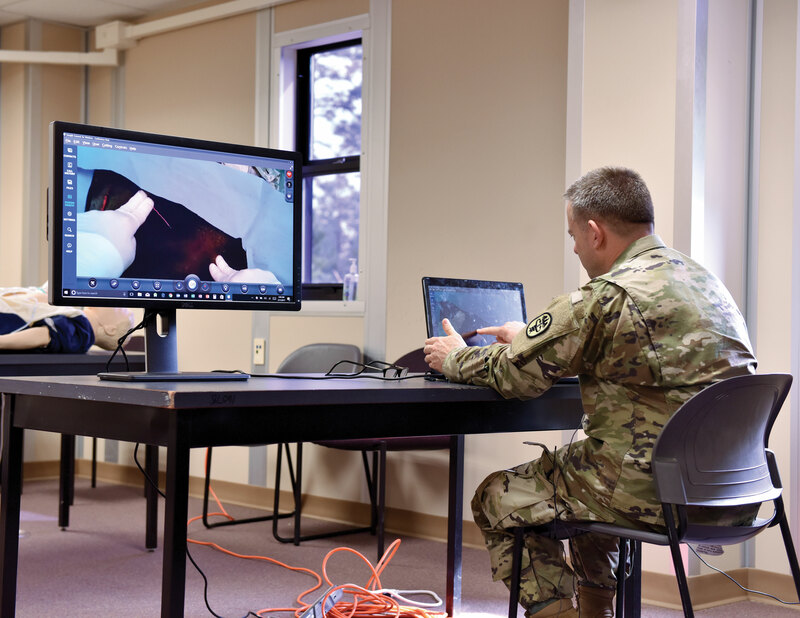 S&T investments in medical and nonmedical augmentation technologies look to improve Soldier performance while reducing the physical, perceptual and cognitive workload and enabling units to operate at a sustained high tempo. Applying HSI principles and practices before designing equipment is a key to achieving physical overmatch in a dynamic operating environment and improving Soldier and team performance. HSI applications include man-machine interface, brain-computer interaction and joint human-intelligent agent decision–making, with a focus on early integration of humans and systems. Common human-machine interfaces ensure that Soldiers have flexible, tailorable analytic tools for laboratory-grade, high-resolution assessment of dismount-robot interactions in complex environments. The S&T medical community is the major contributor to research on optimizing Soldier performance, through its individualized regimens of nutrition, “nutraceuticals,” pharmaceuticals and synthetic biology to prevent disease, speed recovery and augment human performance. Some of the major goals are to manage fatigue effectively, optimize nutrition and maximize physical and cognitive performance in dynamic operating environments. The field of Soldier–optimized performance delivers technologies that combine physical, metabolic and cognitive sensors to enable Army leaders to make decisions faster and to sustain resilience, protection and mobility. The Army’s last 16 years of contingency operations have demonstrated that surgical intervention within 60 minutes of injury—the “golden hour”—significantly increases the chances of casualty survival. Because operational threats such as anti-access and area denial challenge the Army’s ability to evacuate Soldiers to surgical treatment within that hour, Army S&T is researching medical materiel and knowledge solutions to accelerate delivery of lifesaving medical care. Our two major programmatic efforts are prolonged field care and autonomous evacuation. Prolonged field care will enable medical personnel, such as combat medics and battalion surgeons, to stabilize wounded personnel for extended periods of time until evacuation is feasible. The capability initially will consist of advanced medical devices to control bleeding from wounds for which tourniquets are not effective, and a closed-loop, extracorporeal (that is, outside the body) life support system to provide lung and kidney function to patients who need it. When medical evacuation is not feasible, the Army will use autonomous ground or air platforms, in conjunction with autonomous life support equipment, to move casualties to surgical care facilities. These platforms also will be useful for resupplying medical personnel during sustained operations. Army S&T investments in autonomous systems and advanced medical devices will provide tomorrow’s force the dramatic increase in survival rates that the Army’s first aeromedical evacuation brought to wounded Soldiers in Korea. Increasingly complex equipment, the rise in speed of conflict and increasing demands for diverse skills, such as cyber and languages, are driving Army S&T to research state-of-the-art methodologies and tools to support learning and training. These tools must outpace the learning demands arising from complex environments and provide Soldiers the expertise and confidence to synthesize information, rapidly make decisions and act upon those decisions to outmaneuver adversaries. New training technologies and environments will allow Soldiers to train and rehearse warfighting skills such as faster decision-making to gain the advantage of speed over adversaries, with integrated capabilities such as intelligent agents that challenge the Soldier to improve individual and team performance and develop agile, adaptive leaders. As Army training missions increase, S&T has the challenge of replicating sufficient knowledge and time for every small unit on dispersed and varied battlefields. Investments in training tools such as simulations and synthetic training environments will increase retention, enhance situational awareness for cognitive overmatch, and improve Soldier and team performance while reducing training time and cost. The future vision of land warfare is being shaped by today’s S&T investments across many mature and emerging disciplines. The capabilities described in this article will start to bear fruit in three to 10 years in rapidly advancing information technology and physical and cognitive augmentation technologies, with solutions expected in 10 years or beyond in such areas as biomaterials and artificial intelligence. The Soldier lethality S&T portfolio is shaped by a diverse community of scientists, innovators, end users, technology and global forecasters, and intelligence experts who identify and define the challenges and threats of the future. It employs an iterative analytical process to continually refine its investments and priorities so that future Soldiers maintain the lethality advantage on the future battlefields that are being conceived today. KAREN M. BURKE is a program analyst from the U.S. Army Research, Development and Engineering Command, currently assigned to the Office of the Deputy Assistant Secretary of the Army for Research and Technology (DASA(R&T)) as acting director of the Soldier lethality portfolio. She has over 20 years’ experience across Army S&T and program management, with expertise in HSI and joint program management. She holds an M.S. in engineering management from Western New England University and the Naval Postgraduate School and a B.A. in research psychology from Framingham State University. She is a member of the Army Acquisition Corps and a 2014 graduate of the U.S. Army Acquisition Support Center Competitive Development Group/Army Acquisition Fellowship Program. She is Level III certified in program management and systems engineering. COL. ERIC J. WAGAR is director of the DASA(R&T) Office of the Deputy for Medical Systems and the medical portfolio director. He holds a Ph.D. in immunology and virology from the University of Massachusetts Medical School and a B.S. in general biology from the University of California, San Diego. Path of Greatest Resilience!Seeking Innovative Ways to Restore Our Warfighters!